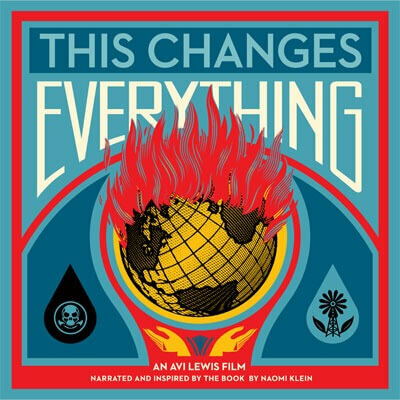 “This Changes Everything,” a documentary film based on Naomi Klein’s book of the same name, will make its northern Illinois premiere Tuesday, Dec. 1, at the historic Egyptian Theatre, 135 N. Second St. in downtown DeKalb. The 7:45 p.m. screening, which is free and open to the public, begins shortly after a STEM Café on “Tales From a Shrinking Continent” ends at nearby Eduardo’s Mexican Restaurant. People interested in climate change are encouraged to attend both events. “What if confronting the climate crisis is the best chance we’ll ever get to build a better world?” Klein asks in the film, an epic attempt to reimagine the vast challenges of climate change. Directed by Avi Lewis, and filmed in nine countries over four years, the documentary presents seven powerful portraits of communities on the front lines. Interwoven with these stories of struggle is Klein’s narration, connecting the carbon in the air with the economic system that put it there. Throughout the film, Klein builds to her most controversial and exciting idea: that humans can seize the crisis of climate change to transform a failed economic system into something very different and better. The film travels the world from Montana’s Powder River Basin to the Alberta Tar Sands, from the coast of South India to Beijing and beyond. Klein’s book has changed the global conversation on climate change since its publication in September of 2014. The winner of the Hilary Weston Prize for non-fiction, it is available around the world in English and is being translated into 25 different languages. A panel discussion will follow the screening, sponsored by the Unitarian Universalist Fellowship of DeKalb Social Justice and Outreach Ministry Committee. For more information, call (815) 793-0950 or email dkenney53@hotmail.com.